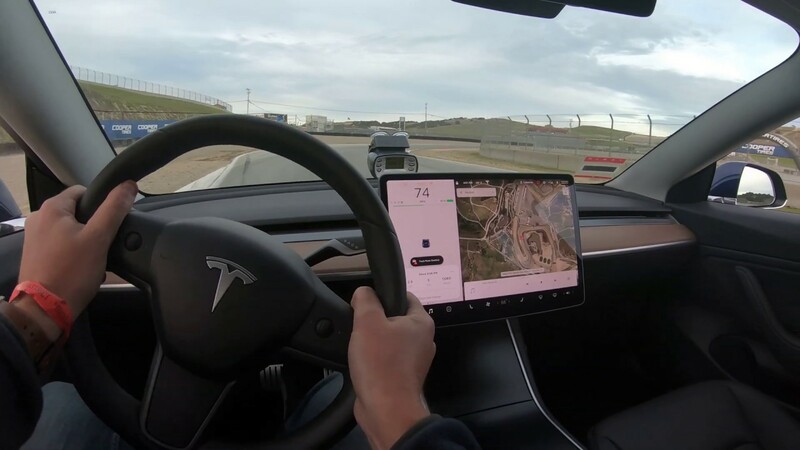 Watch the Sounds of Silence: Model 3 Tesla @ Laguna Seca - TrackHQ.com, the Web's leading forum for track day enthusiasts, racers and time attack drivers. I've come to talk with you again. . . . Silence like a cancer grows . 1:41 is pretty quick for a street car. The issue with electrics has always been the heat they generate and whether they can last an entire session. Usually, not. I don't think that's a good lap time for a Model 3 Performance. it has coilover AND Hoosier A7. I didn't know it had those. Still, can it do one 1:41 lap or can it do 10 in a row without overheating? According to author, it was tested previously on East Coast track 1.5 miles, and was able to do 3-4 laps in a row at full power, so about 4.5-6 miles on full power. That means 2-3 laps of Laguna Seca which is I think 2.25 miles long? Model S is unable to do 1 full power lap of Laguna, so Model 3 has made forward stride. This Model 3 had 275 Hoosier A7s, coilovers, and reprogrammed ECU..so not stock tune. It was lightened I am sure. Typical time-attack or track-day mods. The energy consumption is 6x more than normal driving, according to the test. So if it has 300 mile range typically, on track is has 50 mile range. Issue is there are no EV chargers at Laguna or any tracks.. So you have to trail it full to track, and than you can do some laps and take it home on trailer, or to Monterey nearby where there is a supercharger. To some extent, we have to admit, even factory performance cars like Z06, Mustang GT PP2, and every other car we can think of (Bmw M1/2/3/4/+), EXCEPT Porsche, will likely starts having issue on track if driven "off the showroom floor" to track and driven 3+laps at full tilt. Its actually a shame that these factory performance cars that are sold as "track-worthy", to boil their fluids and fade brakes, and some even ruin mechanical parts. More shame, than Tesla Model 3 only being able to do 2-3 laps, because its emerging technology (Electric performance vehicle). Thing is heavy car like Model 3 is not suitable for track and its pointless to demonstrate its track-worthyness when its 4xxx pounds heavy car, Model S is over 5000 pounds: that is a truck or heavy sedan. Model 3 and Model S are road cars, and I think Tesla's "track-mode" etc is truly a poorly packaged marketing ploy that is appealing to those who are ignorant of reality of track-driving, - majority of people - it appeals to their manliness same as buying Lamborghini yet driving it in 1st gear in town and back to garage feeling like the car's ability is somehow your own ability: its not. But Model 3 has been tested at something like 8.5 seconds 0-100mph, so now what car can come close to that, which does 1.41 on Hoosier A7s at Laguna? I dont get this post... a CTR on Hoosiers would probably run this quick and it def can't got 0-100 in 8.5 sec. A newer M3 can probably close in on a 8.5 0-100 and would sure as hell go faster than 1:41 on Hoosiers. Maybe it's the broken English (not that there's anything wrong with that). I believe Tesla is no heavier than modern ICE with AWD. model 3 weighs within few LB of a Audi RS4 (both awd). Base model 3 weighs a lot less than an A4. Though rwd BMW weighs a lot less. C63 AMG is 200LB lighter, because it is rwd. new M5 (awd) weighs 300LB more than Model 3 Performance. My point is we will need to see a fast driver in the car to know it’s true potential. That 1:41 lap is not driven in full anger. Definitely not it’s true potential. Randy Ponst did a 1:23s at SoW with stock PS4 tires. Otherwise stock. I think that translates to around low 1:40 at Laguna. Put on some RE71R, easily sub 1:40 by a good driver. There are probably 30 Trackhq’ers can do that easily. This Tesla was on Hoosiers and it was not its first rodeo. I don't think you'll get much past 1.41: that is stupid fast for such heavy car..under overall circumstances. Not many will be able to drive any car to 1.41, let alone some novice...novices drive 2 minute laptimes in GT3 let alone Model 3. We, Alfa Club So Cal, have a Model 3 entered in our HPDE School next weekend. I wonder how it will do for 20 minutes on the short track at the Streets of Willow. of all the tracks, SoW is where Model 3 would excel at. EV can put power down, but runs out of steam fast. Randy Pobst did a high 1:20 on SC2 and 1:23s on PS4 I believe.